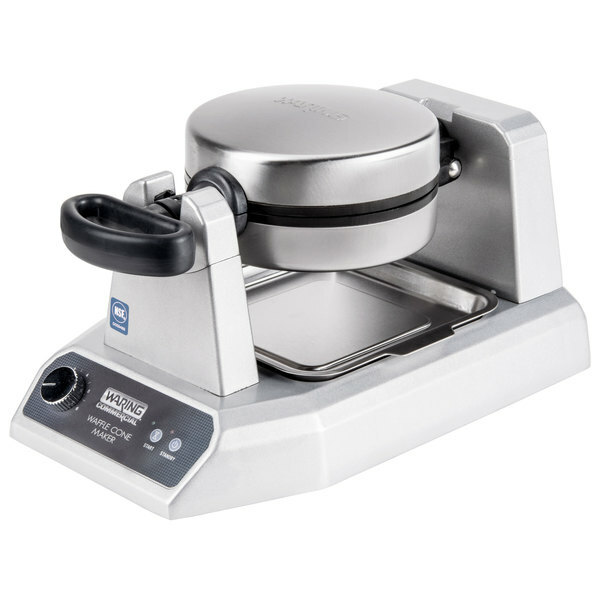 Bake fresh, homemade waffle cones for your establishment with the Waring WWCM180 single waffle cone maker. Offer customers an alluring alternative to traditional sugar or cake ice cream cones by filling the air with the tempting aroma of freshly baked waffle cones! 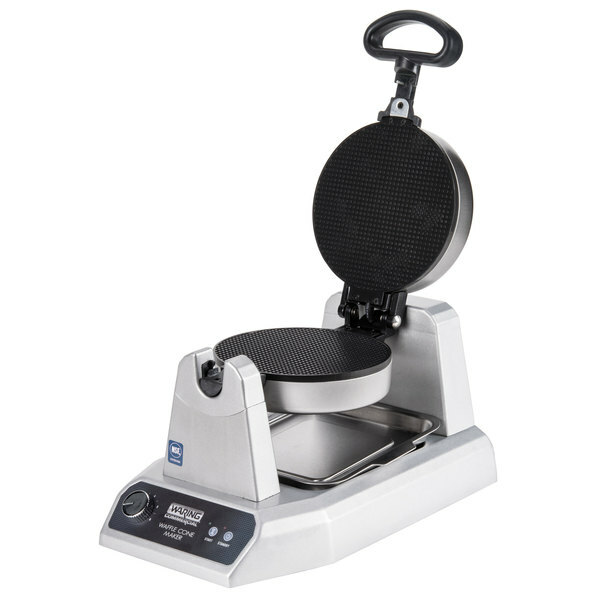 Whether you operate a busy ice cream parlor, concession stand, yogurt shop, or buffet, this waffle cone maker boasts 1200W of heating power to bake up to 60 crisp waffle cones per hour and keep pace with high volume demand. 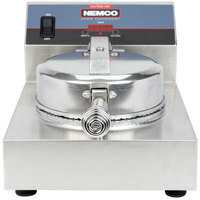 "We have been using the unit for almost 1 year. We really like it in out Gelato shop. It heats up quick and is easy to use. I would recommend this waffle cone maker." With audio and visual signals letting you know when the unit is ready to start baking and when the baking cycle is complete, operation couldn't be any easier. 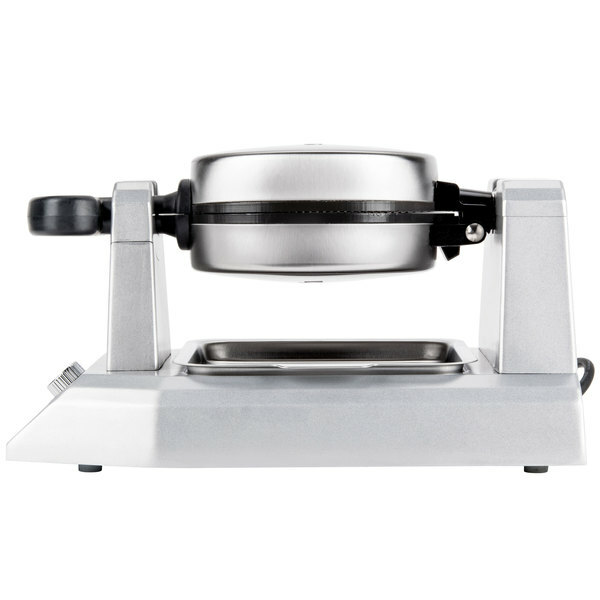 Simply adjust the timer to the ideal bake time for your unique recipe, rotate the grids 180 degrees for a guaranteed even bake, and use the included rolling and forming tools to create the perfect 7" waffle cone. 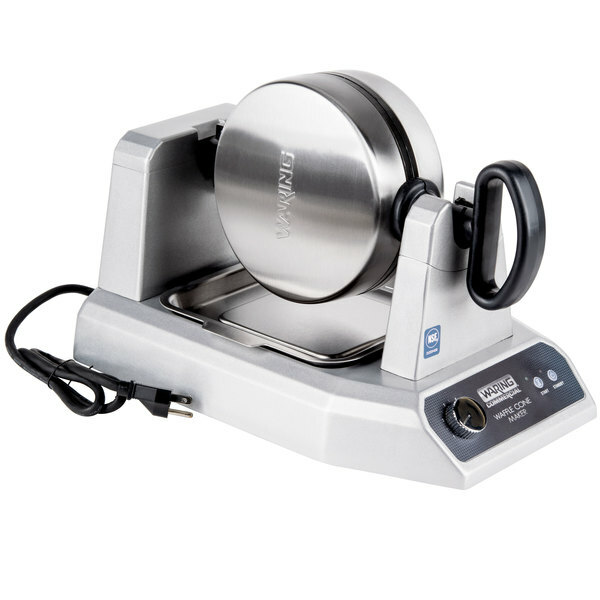 The bake time control knob allows you to achieve the perfect consistency for any recipe. A heavy duty die cast housing ensures the long-lasting performance you demand out of your commercial equipment. 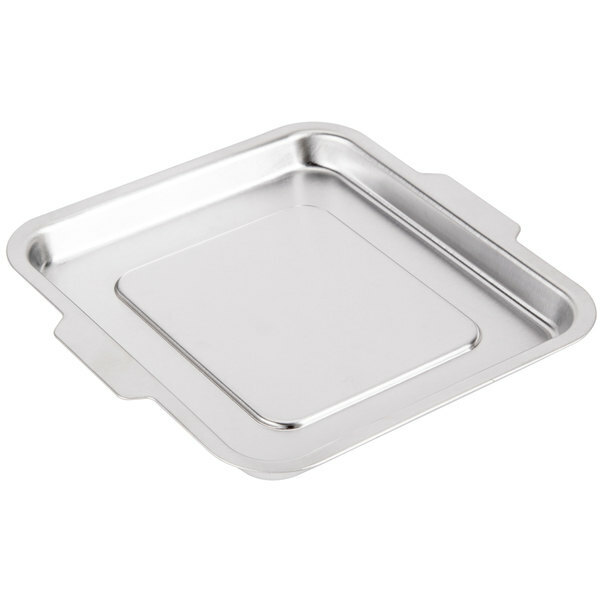 Its triple-coated non-stick grids combine with a dishwasher safe drip tray to make cleanup quick and simple. 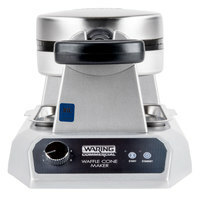 Make fresh waffle cones for your restaurant, bakery, or ice cream shop with a Waring waffle cone maker! You can be sure your cones will be evenly baked and you can even set a browning dial to get just the right amount of crispiness that you desire every time. 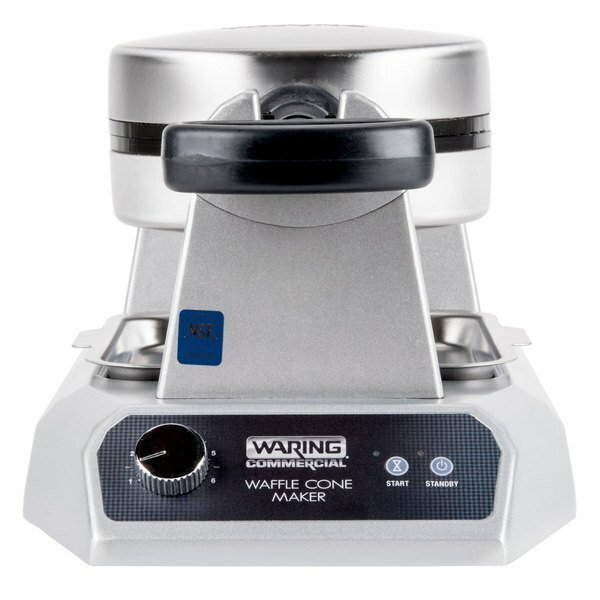 Introducing the Waring commercial single and double waffle cone makers. Make up to 60 or 120 waffle cones or bowls per hour. Fast, easy, fool proof. 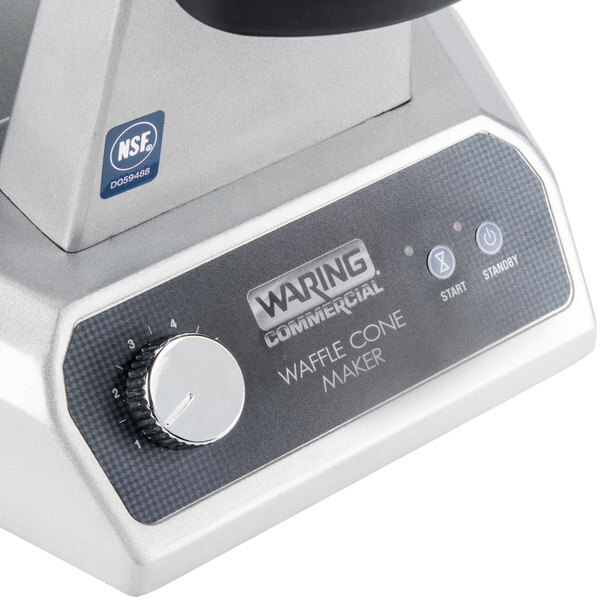 The waffle cone makers have control panels with standby and start buttons, power on, and ready to bake indicators, and an adjustable browning control dial. The control panel wipes clean fast, ideal for busy kitchens. Ready to bake indicators lights on grid plates are easy to see, grids rotate 180 degrees to evenly cook waffles. The heavy duty die-cast base won't tip or move when the handle is turned to rotate the grid. 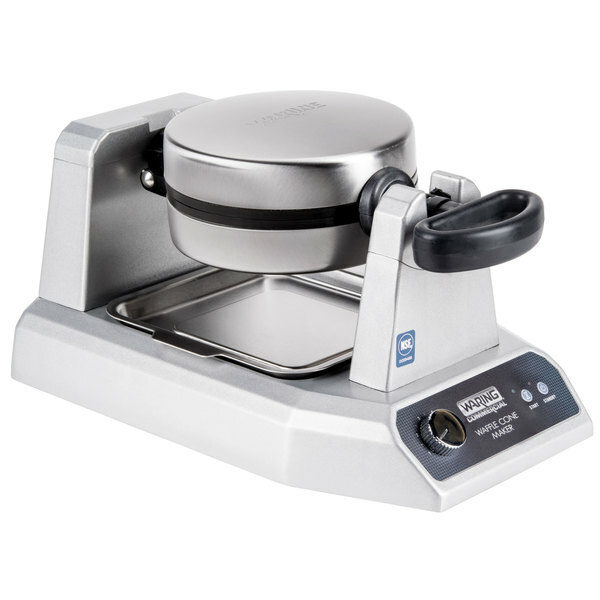 The double waffle cone maker has a shared heating element in the middle and both models have an embedded heating element in top and bottom to ensure quick and even results. 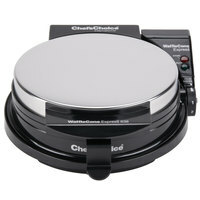 Audible beep sound when the plates reach baking temperature and when your waffle is ready. Waffle cone forming tools and the bowl mold turn warm bakes waffle into perfectly shaped cones or bowls effortlessly. To use the single waffle cone maker gather ingredients for your batter. Press standby, the red power indicator light will illuminate. Grids take about 5-10 minutes to heat up, plenty of time to mix your batter. 6 audible beeps sound when the grids reach temperature and the green ready indicator will illuminate. Use the browning control dial to set baking time. Now, open the unit, spray top and bottom grids with non-stick cooking spray and drop 3 TBSP of batter onto the center of the grid. Close and rotate 180 degrees. Press start. The green indicator will blink while the waffle bakes. The waffle cone must be rolled while the waffle is still hot and pliable. When the green indicator light stops blinking and three beeps sound the waffle is fully baked and ready to roll. Rotate the unit and open. Use high temperature tongs to gently loosen edges and remove the flat waffle. 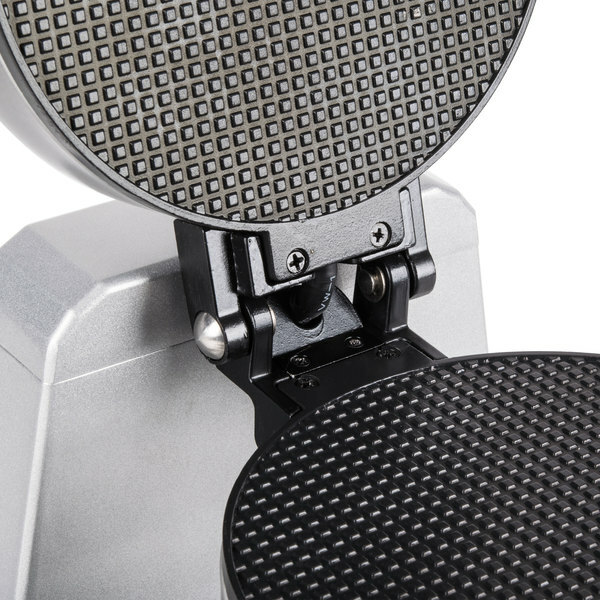 Place on the flat rolling plate with the waffle edge close to the point of the cone mold. Insert the rolling tool. Slowly turn it counterclockwise. Guide the waffle into the cone mold as your turn. Leave the tool in the cone mold for a few seconds while the waffle cools. Bake your next waffle while the cone is cooling. You can remove the cone as soon as it's cool enough to hold its shape. Continue to bake and form cones, up to 60 per hour! 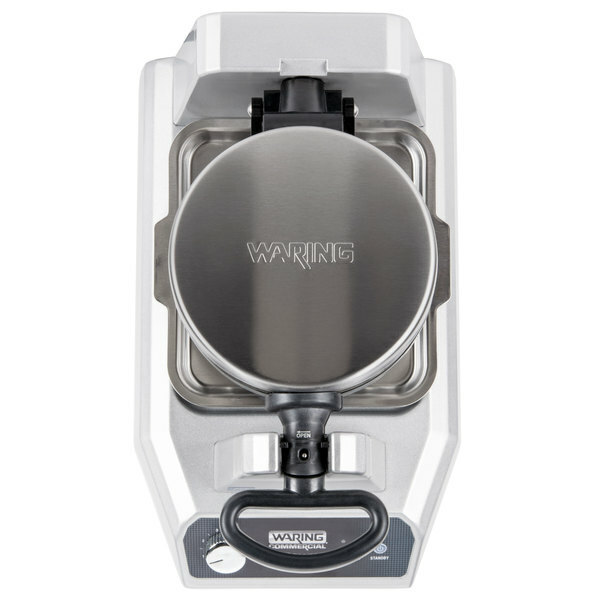 With the Waring Commercial single waffle cone maker. 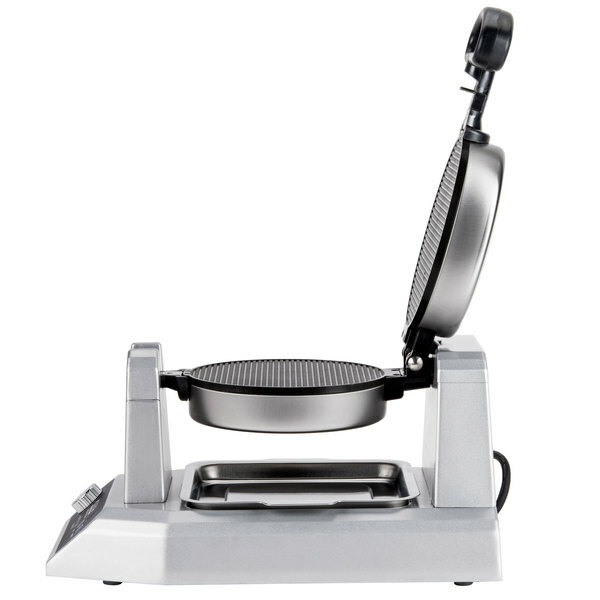 To double your output use the double waffle cone maker. The stacked design saves space. 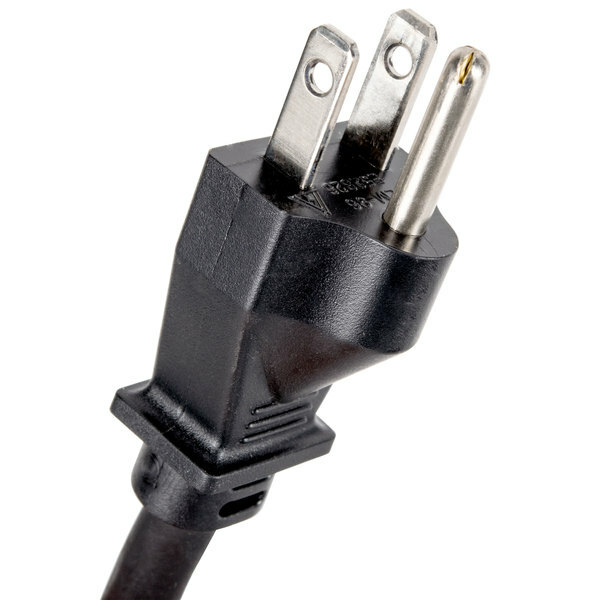 The shared center heating element is energy efficient. And, you can bake 2 waffles at once. The 2 start buttons and top and bottom grids have their own corresponding green indicator lights. When the green indicator for grid 1 is illuminated, open, spray, add batter, then close, rotate, and press start 1. Repeat this same process for grid 2. Spray, add batter, then close, rotate, press start 2. 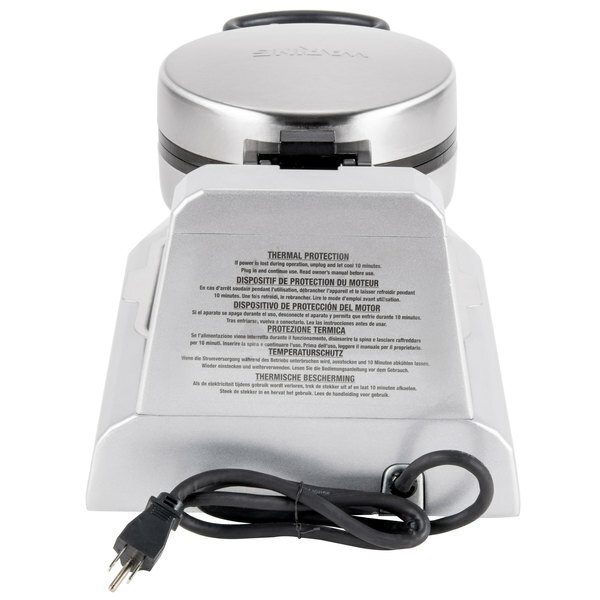 Both lights will blink while the waffles bake, when the green indicator light for grid 1 stops blinking and the audible alert sounds remove the hot waffle and place it on the bowl forming tool. Gently push down and allow to cool. While the waffle bowl cools start your next waffle in grid 1. Remove the bowl as soon as the waffle is cool enough to hold it's shape. When the indicators for 2 stop blinking and 6 beeps sound remove the hot waffle and guide it into the cone mold to form a waffle cone. While the waffle cone cools bake your next waffle. 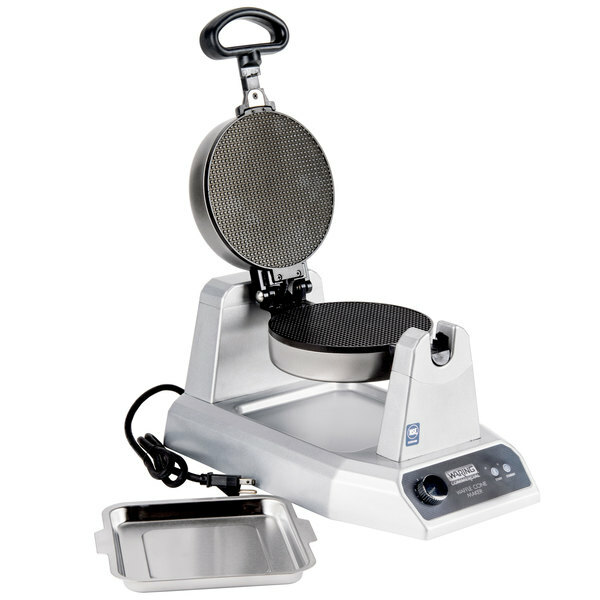 Continue to bake and form waffle cones and bowls until you have the number you need, up to 120 per hour. 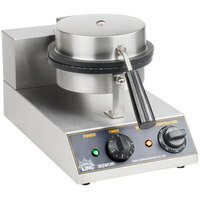 Waring Commercial single and double waffle cone makers. Make fresh waffle cones and bowls easy, from start to finish. We have been using the unit for almost 1 year. We really like it in out Gelato shop. It heats up quick and is easy to use. I would recommend this waffle cone maker. We have a lot of family gatherings. Ice cream is something we have at many of them. It's so nice to be able to make homemade cones. They are fresh and taste much better than the store bought cones. This one of the first Waring Waffle Cone Maker we owned and have always been happy with it. It does take some getting used to as far as getting the right color wanted of your waffle cones. To long and they are more on the brown side to short and they are on the light colored side. Over all the cook time once heated up it about 30 seconds. On key thing to remember is to try to clean off the waffle iron as they do get dirty over time and will leave a dark waffle cone cook on your cones. Lastly, these waffle cones the Waring produces are not your standard waffle cubes, Waring's cubes are quite smaller then your Carnival King Iron. I enjoy experimenting with my waffle cone maker for the first time. The waffles taste even better than the ones you buy in the shop. Fresher and crispier. The customers love it. I never had any that cracked either. I am disappointed of waring waffle cone maker. I got it a week ago try one bake batch using waring waffle mix. Its perfect cook, but today i try again some how the machine not cook even the back hard the front soft. I use same temperature at 3.5 setting. When roll its cracked. I really wsnt to return but i had threw away the package only the box left. We are sorry this waffle cone maker did not work for you. 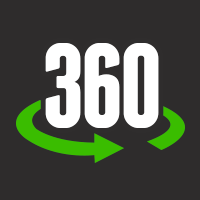 This item is under a 1-year full warranty, a Customer Solutions Representative will contact you about this shortly! This waffle cone maker works really well, I'm afraid of one thing, if it's going to last long because of the continuous rotation of the handle every time you prepare the cone. Anyway, it works perfectly and the temperature is adjustable. Waring Single Waffle Cone Maker makes the perfect size waffle cones for the perfect frozen yogurt treat! It is very easy to use and the cones come out the perfect golden color every time!